Alabaster is a form of gypsum. Because it is a somewhat crumbly stone, it can actually be used for chalk markings. It's mostly white in color, sometimes it will have just a "hint" of soft colors as well. It is a very soft stone, 2 on a scale of 1-10. It is easily carved into charms etc. But because the alabaster is such a soft stone it can be used in different ways. Perhaps its most helpful among its stone healing properties is its absorption qualities that can help draw energies that you are lacking in any way. Melody, author of Love is in the Earth (a must-have reference book for your crystal healing library), believes that alabaster can unlock secrets of the pyramids when used during meditation, taking the meditator to the time period when the pyramids were being built. 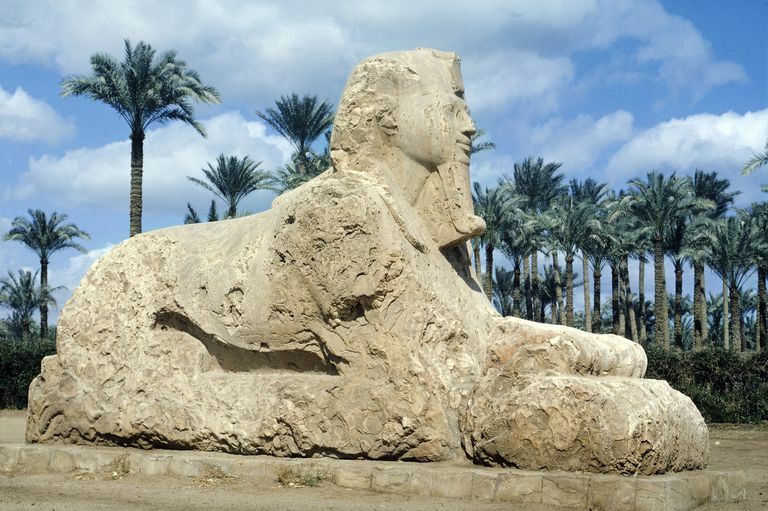 Indeed, the ancient sphinx of Egypt was carved out of alabaster. Aids Forgiveness: Can assist in erasing away long-held grudges. Stimulates Meditation: Excellent stone for bridging the gap between physical and spiritual lessons. Keep it handy among the healing stones on your crystal altar. Mind Healer: Gives mental clarity, clearing away any confusion or cobwebs cluttering the mind. Manages Anger Issues: Helps to tamp down any anger flare-ups. Creative Bent: This stone is meant for the artist to help spark creativity. It is a "drawing" stone meaning it has the ability to draw things to you or to draw things away from you, depending on what your needs are. It works wonderfully for drawing things that are spiritually connected to the user. In fact, the white color summons the spiritual. Alabaster is handy when searching for your spiritual path, as well as drawing sigils, wards, and some spells. Similarly, it can be useful when conferring with spirit guides. Because the alabaster is so soft, it does best with a sun cleansing and should not be used in making elixirs. Alabaster can draw forgiveness, whether it be you that needs self-forgiveness or the ability to forgive someone that has done you wrong. It also draws energy from other stones as well, meaning you can "soak" up the energy of one stone and have the properties of both stones with you while only carrying the alabaster. It helps to draw anger out of a person and release it to the light. This stone is excellent in creating art. It helps promote creative energy and artistic clarity. It's useful when looking for a slightly altered perspective. It aids in promoting inspiration and intrapersonal exploration when used as a tool directing your energy and artistic intent. Alabaster is great for working through an artistic block or working on a skill or project that needs to be bumped up to a new level.